Park Place Estates is ideal for Winter Texans and our Canadian friends seeking an escape from the north's cold, snowy winters. Our gated community, located in the Rio Grande Valley (RGV), is surrounded by citrus groves in a beautiful, sub-tropical setting. Park Place Estates RV Resort is located in warm and sunny Harlingen, Texas, just 1 block from Expressway (Interstate) 83. This gives our guests convenient access to the best attractions in the Rio Grande Valley and Northern Mexico. We are close to the warm waters of the Gulf of Mexico. Port Isabel and South Padre Island offer many opportunities including swimming, deep-sea fishing and just lounging on the world famous gulf beaches. 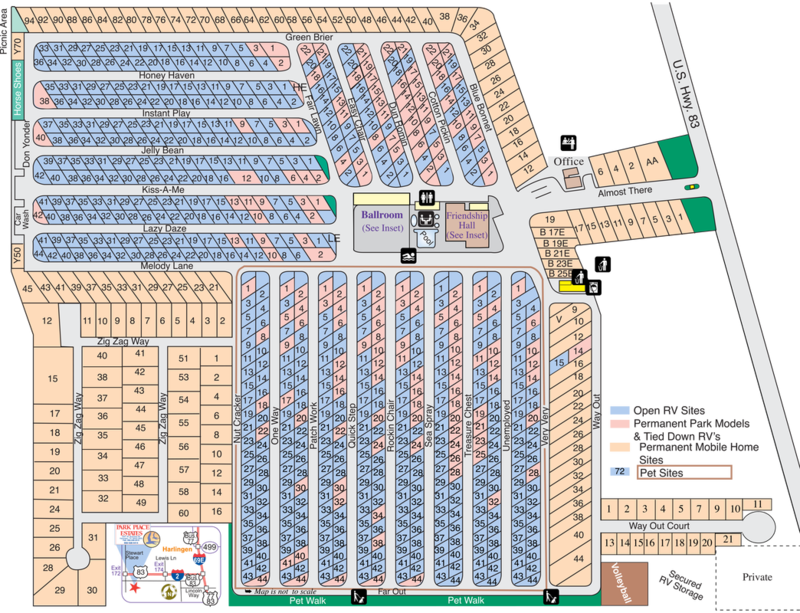 You'll find 3 major shopping malls within a 30 minute drive. There are modern grocery stores, banks, pharmacies and just about any shopping you would enjoy in a major northern city. There are lots of great restaurants too! You can swing your partner to a live big band in our 9600 sq ft ball room. In season, we have weekly dances, jams, live music, and entertainment. We also have weekly "happy hours" for you to get acquainted with other park residents. Lounge by the pool or relax in one of our 102 or 104 degree spas. Shoot a game of pool in our pool hall. Other on-site amenities and activities include: volleyball, shuffleboard, horseshoes, bingo, bicycling, card games, Red Hatters, sewing and quilters groups and craft shows. We have line dancing classes offering Texas two-step and square dancing lessons. ​Park Place is considered one of the top RV Parks in Texas. Our region has milder weather than Arizona and is more laid back and less humid than Florida. Our area is less expensive than either Arizona or Florida, with less traffic congestion & sunny, breezy winter days. We offer mobile home, RV, and park model sites for both permanent and seasonal residents. Park Place is a world away from the cares of city life, yet freeway-close to all that makes South Texas the destination of choice for many RV travelers. Browse this web site for more information about Park Place.